The only bridge in Britain that still features a fortified tower above the waterway, though there is a bridge in Northumberland with a fortification at one end. 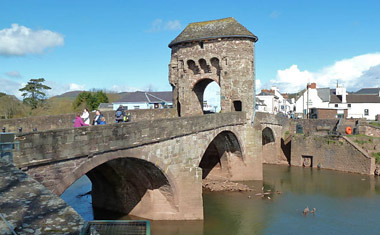 Monnow Bridge, on the south Wales border with England, is part of Monmouth town walls and is a Grade I listed building. Now bypassed, it has been restored and is in use for pedestrian traffic. The 34.75m long red sandstone bridge was built in 1272 as a defensive structure. It consists of three semicircular arches, each with three wide ribs. The two six-sided river piers have pointed cutwaters, which on the western pier end just above the springing point. On the eastern pier, they narrow at the parapet and continue up into the sidewalls of the fortified tower. The tower was added between 1297 and 1315 and takes the form of a gatehouse, oval in plan, with a rounded masonry arch over the roadway. On the west side of the tower are three relieving arches and a projecting garderobe (privy). Originally the structure overhung the sides of the bridge, and had a portcullis and sentry battlements. In 1705, the rampart’s parapet was removed and the walls heightened to make the gatehouse into a habitable building. A two-storey lean-to extension was added to the eastern corner. This was timber frame with lath and plaster panels, and apparently jutted out over the water, supported on a timber beam and stone pillar arrangement. The extension was demolished in 1815. In 1819, the bridge was widened to 7.3m between parapets, using segmental arches matching the existing stonework — adding 1.1m in width on the upstream side and 1.5m on the downstream side. At the same time, the cutwaters were refaced and a pedestrian access way with pointed arch was cut through the northern side of the gatehouse walls. The work resulted in the demolition of the original spiral stone staircase. Above the arch of the gateway, the tower now contains a single room, 11m long and 3m wide, under a pitched slate roof with rounded ends. The roof was reconstructed in 1832 and, in 1845, a pedestrian footway was cut through on the south side and later repaired with a concrete roof. Over time, the tower has had many uses, including use as a toll house, a guard room, a gaol, a warehouse and a private residence. Masonry repairs in yellow sandstone are evident. In 1974, the bridge was given a Grade I listing. In 1988-90, river works at the site — part of the Monmouth flood alleviation scheme — revealed oak timbers from an earlier bridge beneath the present one. Scientific analysis of the tree rings showed that the timber was felled 1123-69, which implies construction around 1170. The timbers have been preserved in situ. In 2004, a new bridge was completed to carry the B4293. Monnow Bridge was then closed to wheeled traffic and comprehensive repairs began. In 2012, the structure was strengthened using a grid of grouted anchor bars. The repairs are almost invisible behind cores of the original masonry, which were replaced and repointed with lime mortar after the insertion of the grid.